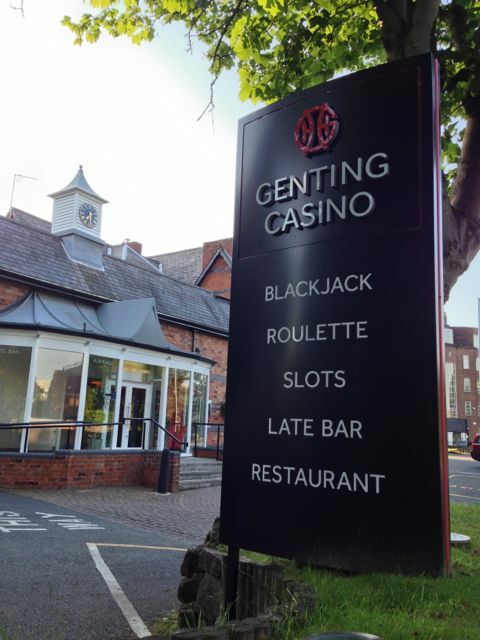 After our recent foray in to Moseley to eat at the fabulous Carter’s, we thought we’d get another stamp in our passports by going out to Genting Casino at Edgbaston to eat at their newly refurbished Farenheit restaurant. Until recently my mental vision of casinos in the UK was somewhere frequented by the Arthur Daley types – faded pleather seating, beer stained floral carpet, and a somewhat seedy feel. Having visited two in twelve months I have to say I was pleasantly surprised that this image is now far from the truth. The Genting casino, just five minutes up the Hagley Road in the leafy suburb of Edgbaston, has just had a makeover. The restaurant now looks particularly swish with stylish seating, white linen and gleaming tableware all reflected in large mirrored walls, and lit not only by design conscious fittings but also by windows – natural light is not something you see in many casinos. There’s no formal dress code, other than “smart casual”, and you don’t need to be a member to play in the casino or indeed dine with them. They’re another venue to go with the current trend of fancy grills. They’ve installed a “Josper charcoal oven” which “maintains a high cooking temperature of 1000 degrees Farenheit”. Good job we all like a BBQ with here, Fiesta Del Asado, and Fleet Street Kitchen all installing similar cooking devices over the last year. The menu is therefore grill heavy, but does have a good mix of other dishes including four fish dishes. 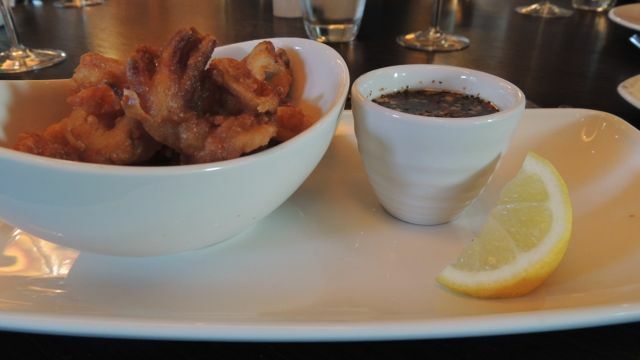 For starters I had the salt and pepper squid. It was perfectly crispy, and came with a beautifully fragrant spicy-sweet dip. The squid batter could’ve done with a little more ground pepper, but that’s probably just personal taste – I would still give it 9 out of 10. 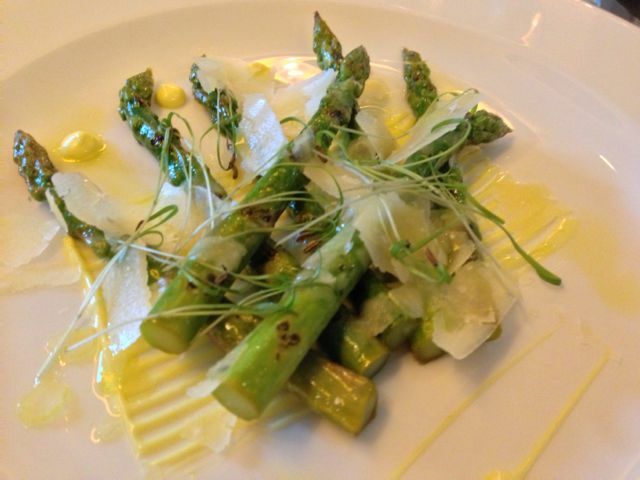 We also tried the grilled asparagus with truffle oil and parmesan, which was fresh and tasty. The wine waiter was knowledgeable and selected for us a Sancerre that was completely delicious. For mains we obviously had to try a steak from the grill. 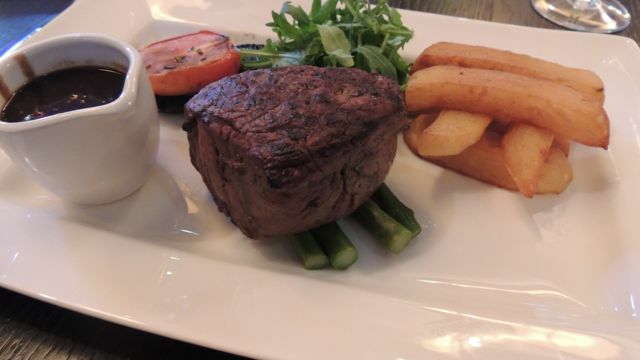 We went for a fillet with the most amazing Cornish sea-salt triple cooked chips, and the house “Farenheit” sauce. The fillet was well flavoured, and I loved the sauce which had an initial earthy chocolate kick (although savoury not sweet) followed by a chilli heat. Our other dish was monkfish tail that had also been grilled. It was a pretty plate incorporating pansy flowers. 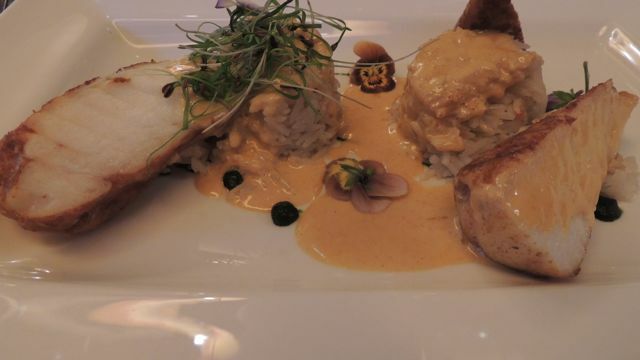 The coconut rice was delicately flavoured and complimented the hearty portion of monkfish well. On the side the waiter convinced us to have some cauliflower fritters which I really enjoyed. I’m no gambler but I could see the attraction of dinner followed by an hour or so of roulette or black jack. 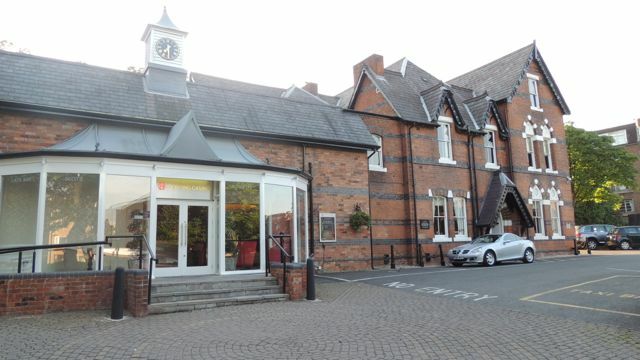 They are really trying to push the restaurant offering and at the moment there’s a £15 three course deal on a slightly reduced menu, and on Thursday 27th June there’s a dinner with live music and narration paying tribute to Eva Cassidy. Details on their website. Dinner without wine will set you back about £25 a head, with a cocktail or large glass of wine around the £6 mark. I think it would be ideal for a family meal (although over 18s only – thanks to Rob for the reminder of this), or even date night with a flutter on the black jack table later with a martini. This entry was posted in Area: Hagley Road, Cuisine: English, Cuisine: Modern Mixed, Cuisine: Steakhouse, Price: Average, Price: Get your dad to pay - above average, Venue type: Bar, Venue type: Cocktail Bar, Venue type: Entertainment, Venue type: Restaurant and tagged birmingham casino, birmingham casino restaurant, Birmingham Restaurant, birmingham restaurant review, birmingham review, birmingham steakhouse, hagley road restaurant, Out In Birmingham, out in brum, restaurant review, Where To Go In Birmingham. Bookmark the permalink. Just to confirm on the ‘family’ point, what are the house rules on under 18s being brought into the restaurant (bearing in mind it is a casino!)? Good spot Rob! I’ve spoken to the casino and it is over 18s, I’ve now updated the article to say this. Sorry for the confusion and thanks for the pointer.